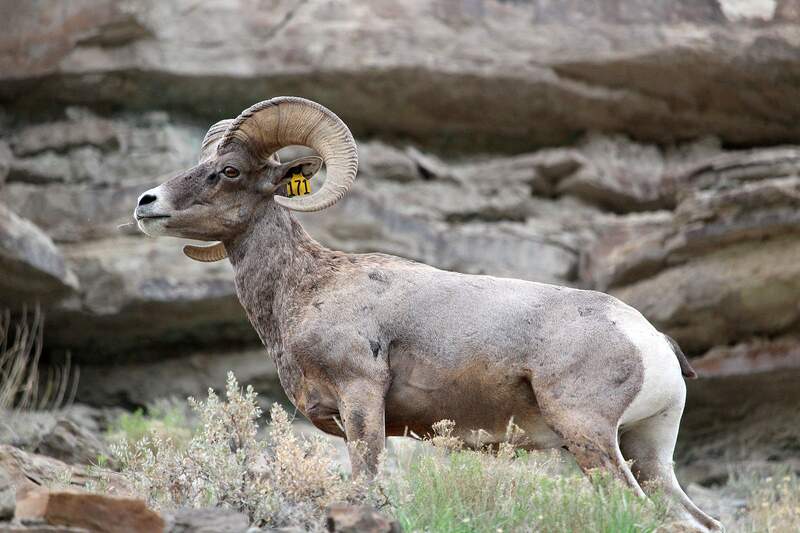 Introduced desert bighorns routinely travel between Escalante and Dominguez canyons. With only about 500 in Colorado, they are a delight to see. 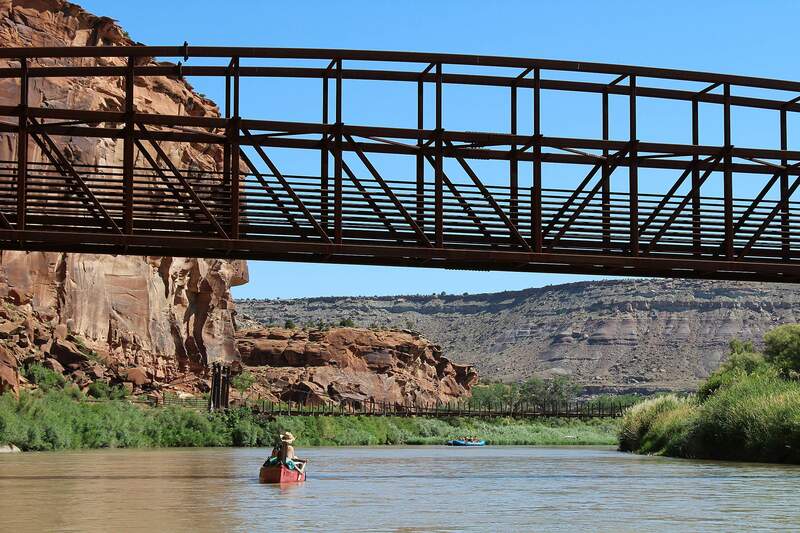 The large canyon in the 66,000-acre Dominguez Canyon Wilderness is accessible by canoe from the Gunnison River or by a metal bridge from the Bridgeport Road south of Grand Junction. 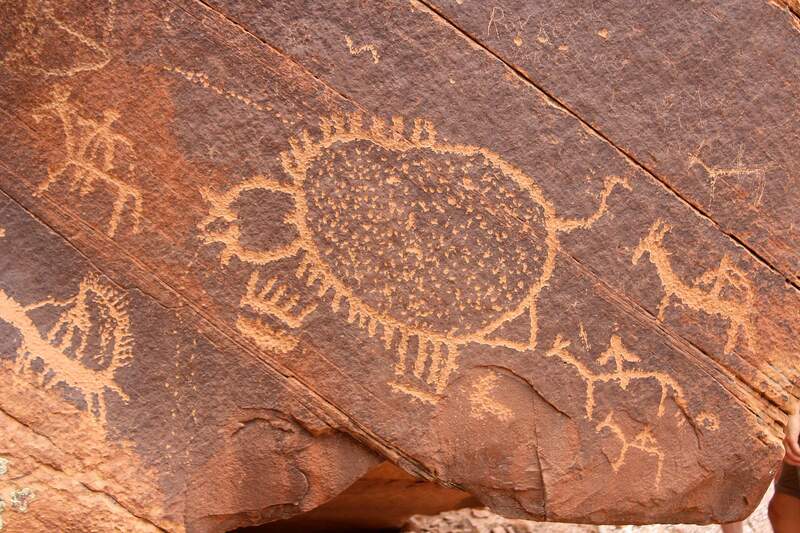 An outstanding historic Ute Indian petroglyph is this bison-hunting scene with the vanquished bison spurting blood. 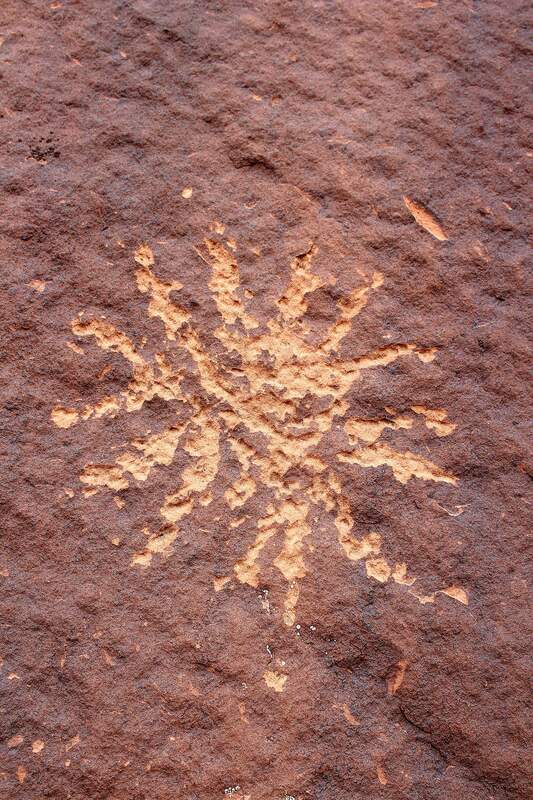 This small but dramatic petroglyph may be a depiction of the supernova that exploded in 1054 and was seen around the world. 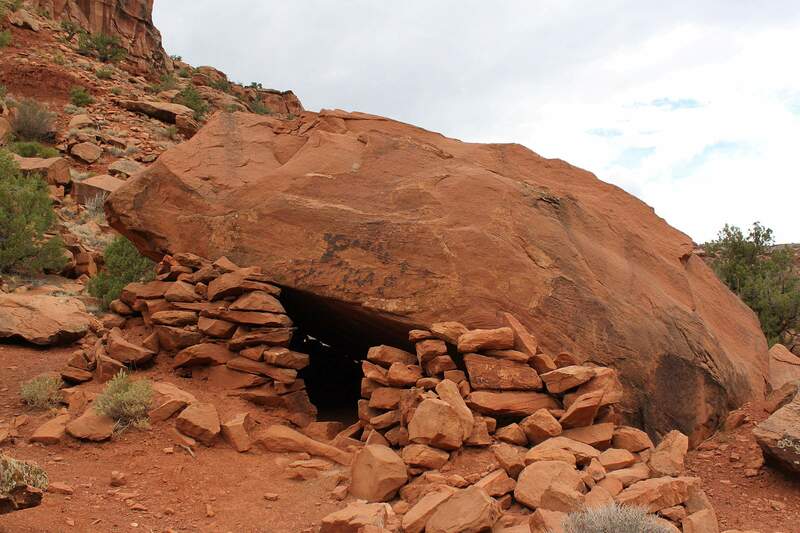 Human habitation in the Dominguez-Escalante National Conservation Area goes back 10,000 years. 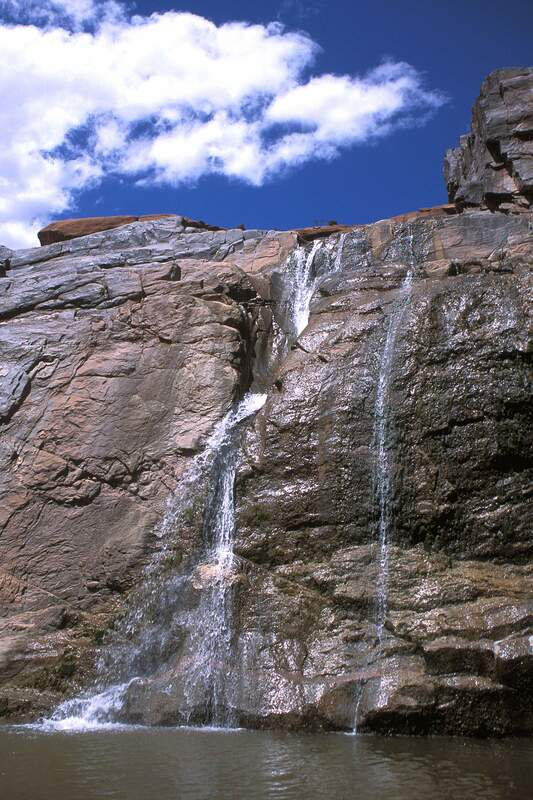 When Big Dominguez Creek is in full flow, waterfalls cascade off the ancient rocks into wading pools below. 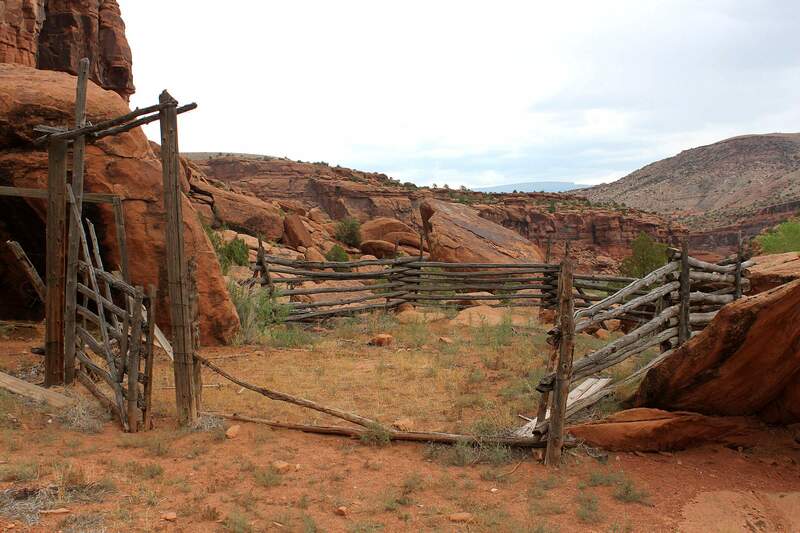 Just across the wilderness boundary is this historic cowboy corral from the 1914 Ennors homestead. 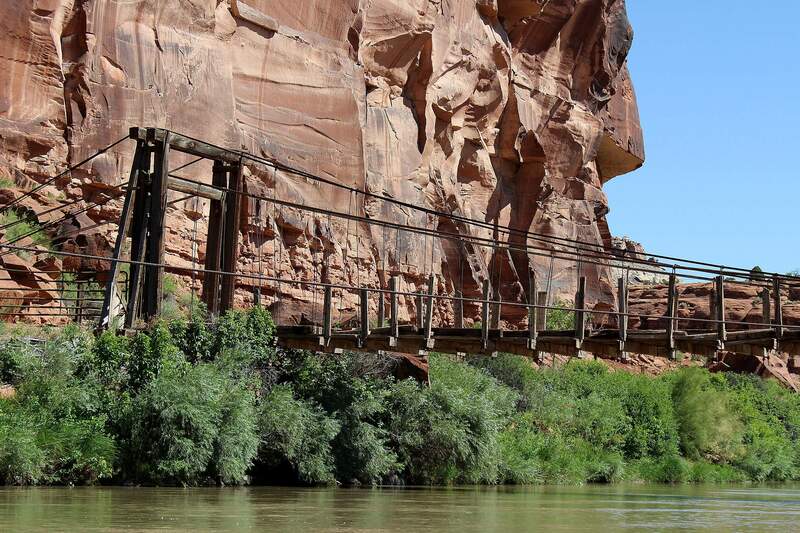 One of the last historic wooden suspension bridges in the Rocky Mountains, this bridge was moved to the Gunnison River from the Colorado River in 1935. It now provides private ranch access. 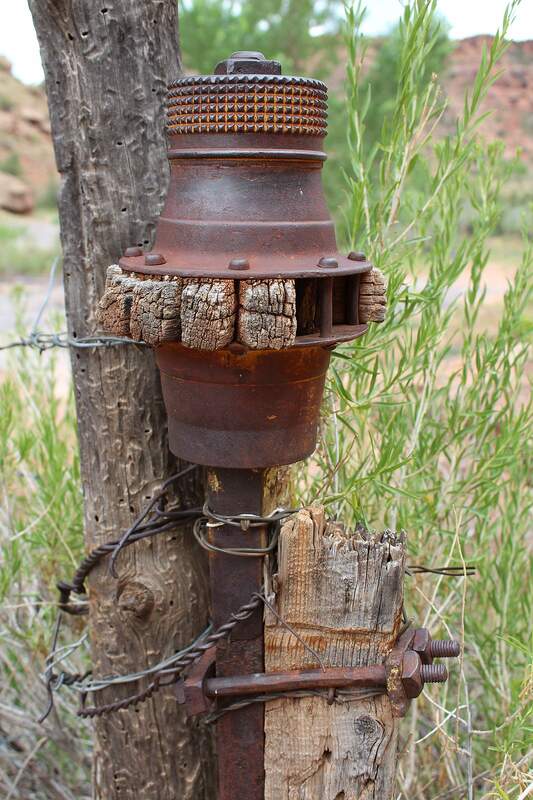 A wagon axle recycled into a gatepost is proof that hardy Western Slope pioneers used everything they could find to establish themselves on the frontier. 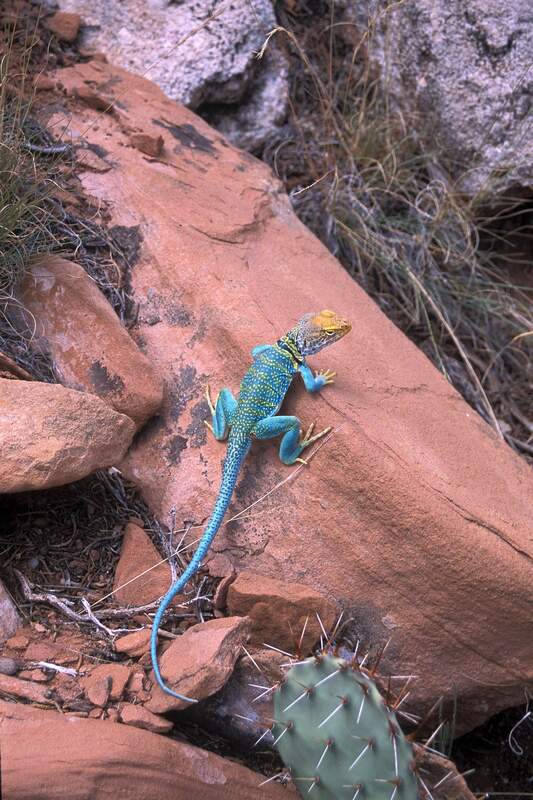 In early summer, collared lizards can be found doing their push-ups and mating dances. A new metal bridge provides pedestrian access to Dominguez Canyon Wilderness from the Bridgeport Road south of Grand Junction. 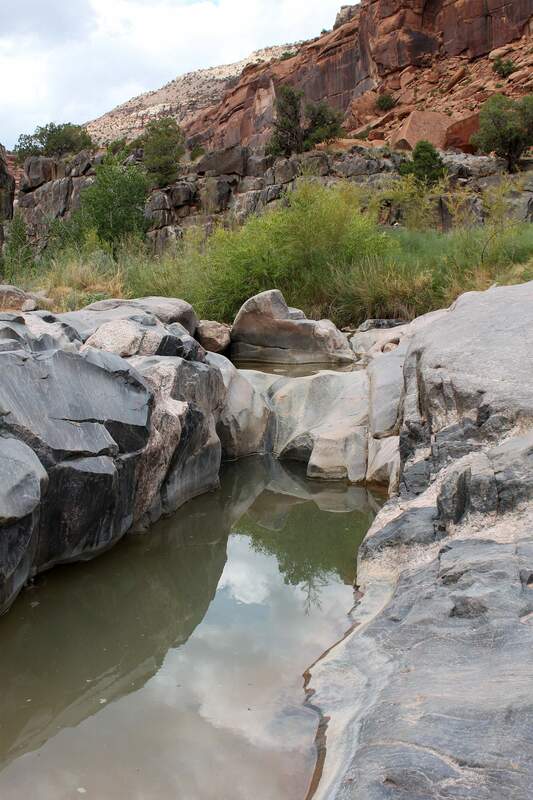 Eons of time and gushing water have taken the hard rock of Uncompahgre schist and sculpted it into small wading pools perfect for summer relaxation. As the snow piles up, I think of warm desert hikes. One of my favorites is a place in Colorado that looks and feels like Utah, except rocks are gone. Dominguez Creek has some of the oldest rocks in the world from the Uncompahgre schist at 1.4 billion to 1.8 billion years old. Yet the visible cliffs are 300 million-year-old Chinle sandstone. Several hundred million years of geology are missing between the cliff tops and the creek bottom. Geologists call this missing strata The Great Unconformity. 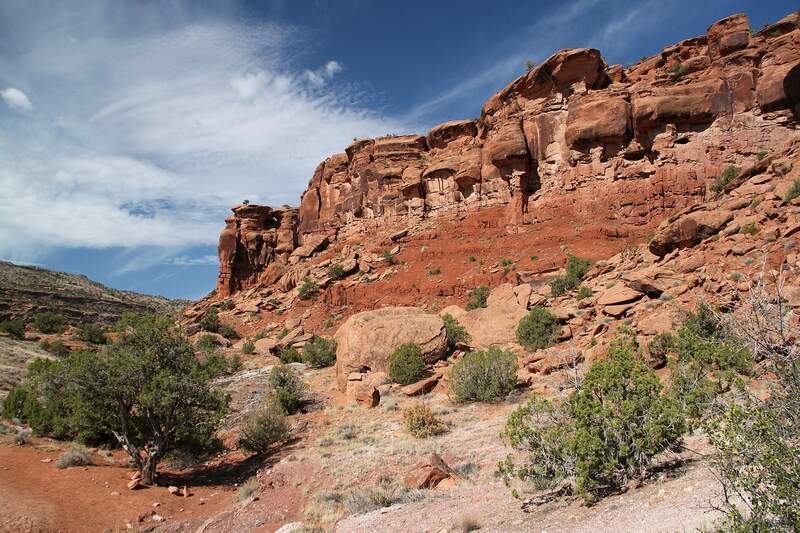 Hikers can see it in the Grand Canyon or you can hike into the Dominguez Canyon Wilderness along the Gunnison River between Delta and Grand Junction. The bottom of Dominguez Creek has hard, brittle, blue-gray rock, yet all around are red sandstone cliffs. Where the schist has been carved by millions of years of water runoff from the Uncompahgre Plateau to the west, there are pour-offs and pools as smooth as a newborn’s bottom. Rare plants and animals with prickly pear cactus and Indian rice grass grow within feet of narrow-leaf Fremont cottonwood trees. Collared lizards enact marvelous mating dances. They do their push-ups and scamper across red rocks. 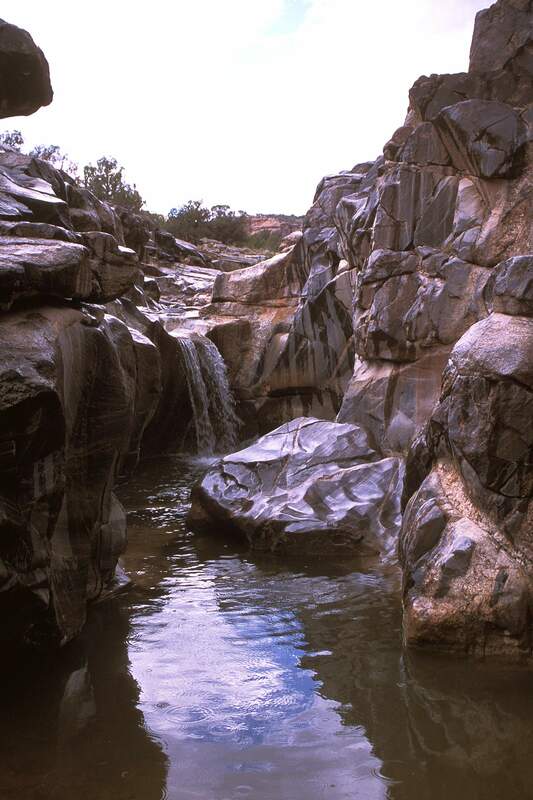 In high summer with temperatures in the 90s, the bare-breasted, brown-bottomed skinny dipper is frequently seen in these marvelous pools and is definitely not an endangered species. Visitors can rest in the shade of cottonwoods and, using binoculars, spy birds like cliff swallows, canyon wrens, ravens, bald eagles, goldfinches, Western towhees, orioles, hummingbirds and, my favorite, small blue gray gnat catchers. Peregrine falcons have nested nearby. Re-introduced desert bighorns stare from cliffs above or silhouette themselves on the skyline at sunset, which is perfect entertainment for beer-drinking campers below. HHHI love to arrive by canoe from Delta or Escalante Canyon and camp at one of the four campsites at the mouth of Dominguez Creek. But even in the dead of winter, Dominguez is easy to get to off U.S. Highway 550 south of Grand Junction at Bridgeport Road. The canyon is a rare palimpsest of time with layer after layer of geology and human history. Petroglyphs include Archaic styles from 1000 B.C. with carved deer and elk, bear paws and a variety of anthropomorphs, or human-animal figures. Ute-style rock art goes from 1600 to 1880, including shield figures and a bison hunting scene with Native Americans on horseback surrounding a bison dripping blood. The Uncompahgre band, Weminuche band and Grand River band of Utes may all have traversed this canyon at different times of year. Certainly, outlaws did. 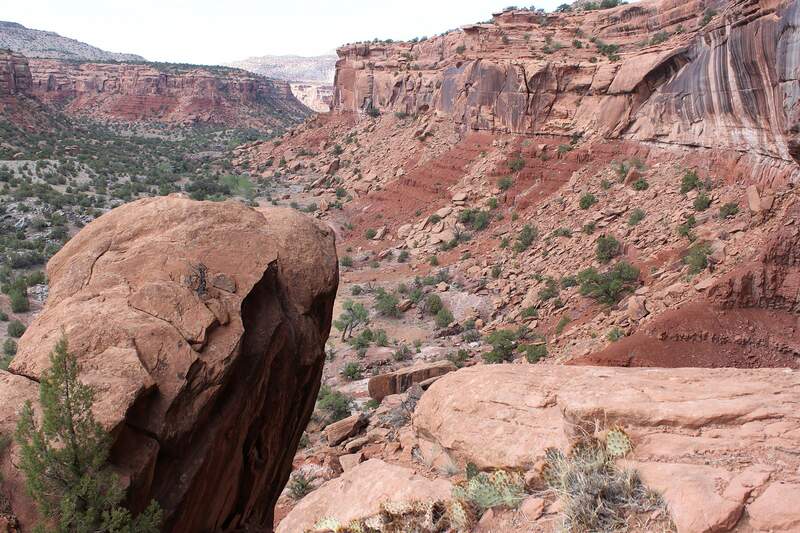 HHHEscalante Canyon to the south and Dominguez Canyon to the north, both parts of the Dominguez-Escalante National Conservation Area, made perfect hideouts for cattle rustlers and bank robbers. The McCarty Trail is a landscape feature named after the McCarty family whose brothers rode with Butch Cassidy to rob the San Miguel Valley Bank in Telluride in 1889. Four years later, Tom McCarty robbed the Delta Bank only to be shot by a hardware store owner with a buffalo gun so powerful that it lifted the robber out of his saddle, dead before he hit the ground. McCarty was headed for a canyon hideout, but instead, he and his brother died in the dust of Delta’s dirt streets. Then there’s the famous canyon shootout of June 9, 1917, when Ben Lowe, who often brought destitute homesteader families sides of beef not his own, faced off with former Sheriff Cash Sampson, who had been a state stock and brand inspector. In a duel on horseback with four bullets, they killed each other having just shared a noon dinner. 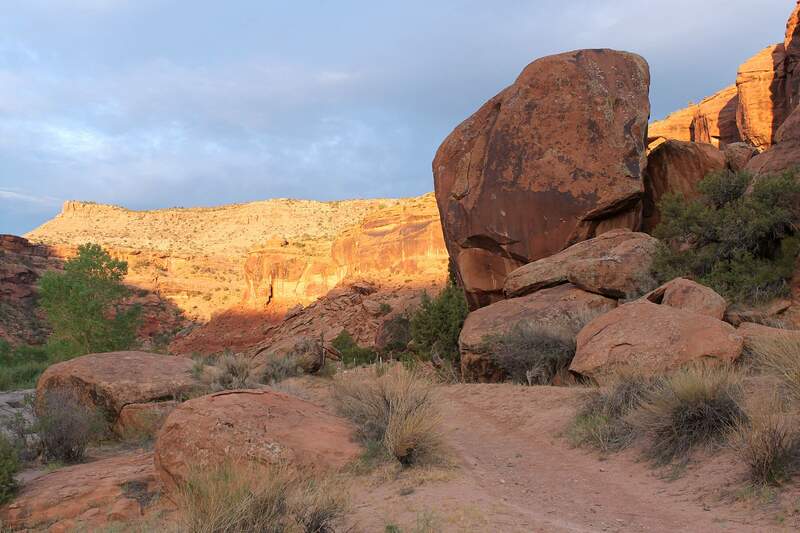 “The canyon is rich in remains of other days that, like place markers in a book, remind us where to turn for favorite stories,” wrote Muriel Marshall in Red Hole in Time. HHHBut of all the prehistory, history and tales told in the canyons, I am most interested in a specific petroglyph. There is Ute rock art nearby, but this panel looks old, very old, and it seems to be the image of a star exploding. Thanks to Chinese astronomers, we have a date. It could be SN 1054, a supernova which exploded in the year 1054 and is astronomy’s most famous supernova. For almost two years, it was visible, and it can now be seen as the Crab Nebula. Described as a “guest star” and “like a path clothed in brightness adorned by countless gleaming lamps,” people around the world saw it as a living, pulsing, fireworks display. Native Americans in the canyons would have seen it. I think they carved it, too. 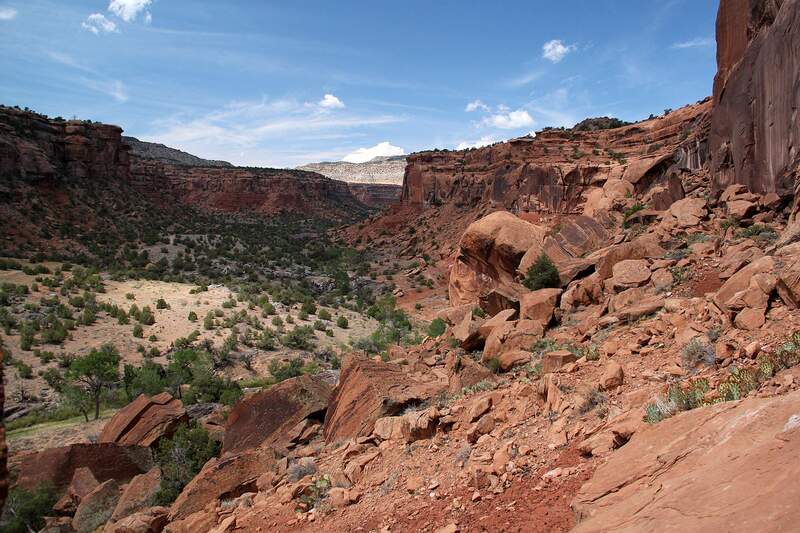 Dominguez Canyon Wilderness within the Dominguez-Escalante National Conservation Area is a special place. Not only did an enlightened Congress vote to preserve the 209,000-acre landscape, but the one private property owner in Dominguez Canyon agreed to donate his family’s homestead to the Bureau of Land Management and let it revert to the public domain. Billy Rambo had a life estate in the canyon and a family house on Little Dominguez Creek. He’s gone now, and the peace and quiet that he cherished endures for all of us.